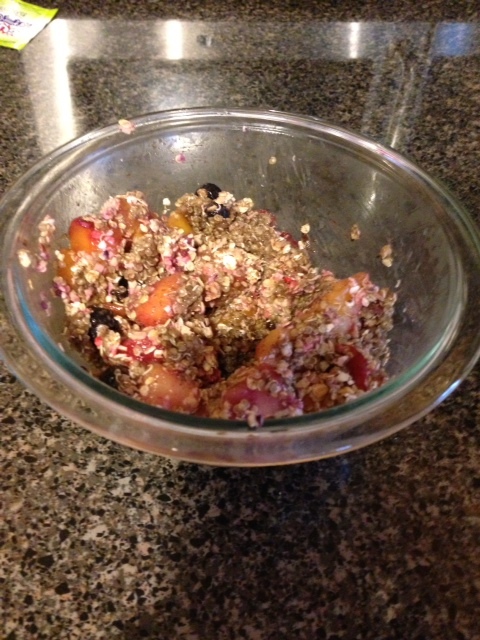 I was so excited to try this because I love quinoa and fruit but I have never had them together. It has a lot of protein I need for my daily workout, plus the great fruits that I love to eat. I did not have any fresh fruit becuase of not being able to make it to the farmer’s market. Instead I used my premade smoothie freezer packs. In these I have blueberries, strawberries, mango and pineapple. I have also included some uncooked oatmeal. 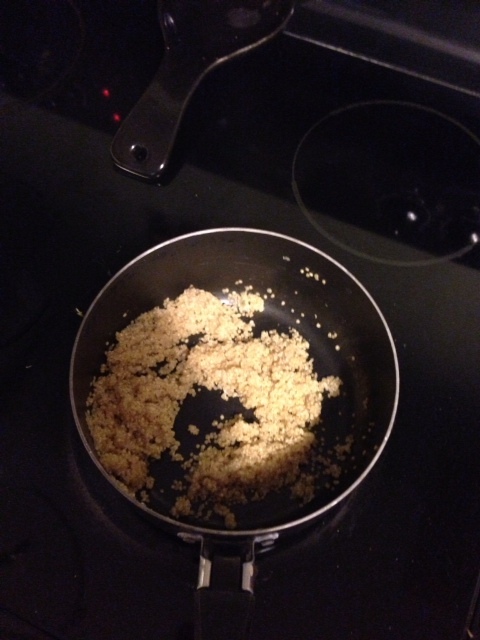 This is a photo of the cooked quinoa. It says to use 1/2 cup of cooked quinoa, I used 1/4 of a cup of dry uncooked and addded 1/2 a cup of water to make the 1/2 cup cooked. You just let it get to a boil, then let it simmer until most of the water is absorbed. 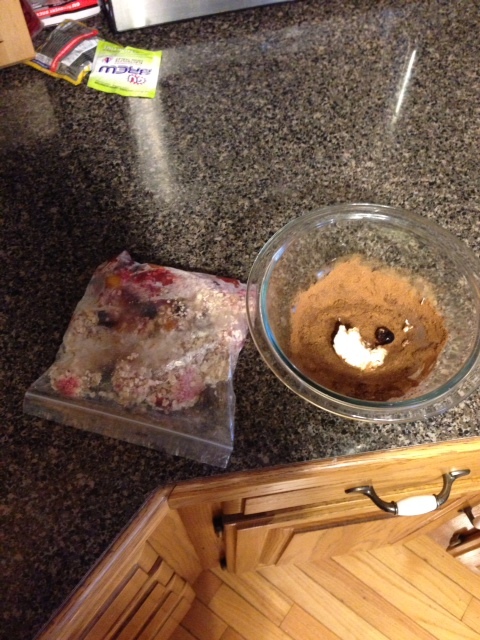 Next I mixed the other ingredients. It called for almond butter and coconut milk, I did not have these, so I used light butter and almond milk instead. The bag is my smoothie pack of the fruit I had. My opinion of the finished product was, so so. It was okay if you like bland healthy food. I was disappointed because I was so excited to make this. I guess you could add sugar which would make it less healthy, but I ate most of it, it just didn’t really have a flavor. Maybe I needed the almond butter and coconut milk like the recipe states. It is a great healthy breakfast but I don’t know if I would make it again. Thanks for stopping by for breakfast! I am always finding new ways to incorporated more vegetables into my daily diet. 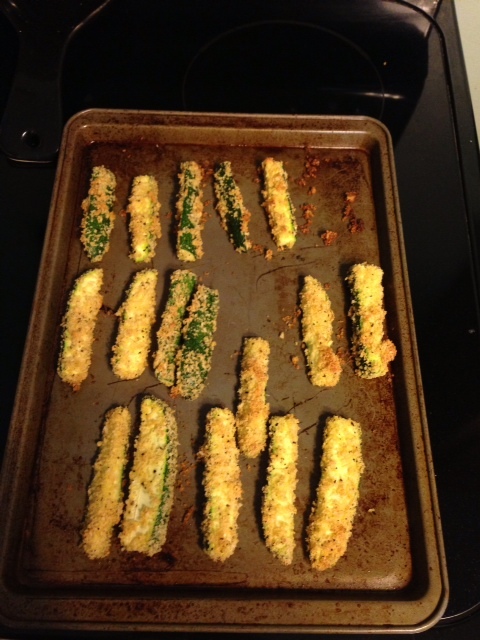 My husband usually is not a fan of plain veggies so I found this recipe for Baked Zucchini Fries. Who doesn’t like a little crunch to their veggies? By adding Panko crumbs and Parmesan cheese, these came out amazing. I loved them and surprisingly my husband did too. Of course we tried them with ketchup, but I only use all natural products and they were still good. They were not too soggy and had just the right amount of crunch. I also made some grilled corn on the cob to go along with these fries and the steaks. All I did was just put them in cold water for about an hour. 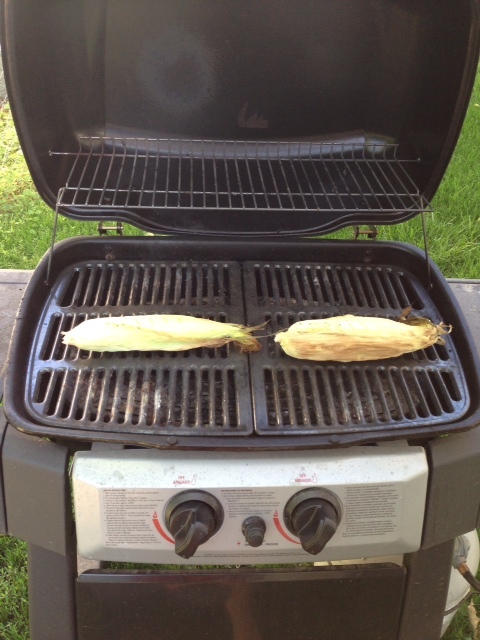 Then I heated up the grill until it was about 350 degrees and set the corn on the grill and left them for about 15 minutes turning when the husks got a little black and crispy. Overall the dinner was a success. I highly recommend the zucchini fries, they were amazing! Until next time, thanks for stopping by! Hey everyone! I decided it would be fun to document all my attempts at recipes I find on Pinterest. I usually cook healthy, low calorie meals and I want to share with people my experiences with the recipes you see everyday on Pinterest. Even if they turn out bad, I will post about them, just so you know if the techniques really work. Thanks for coming and taking a peek into my daily cooking life!